Ten years ago, printing your own greeting cards, pictures, or calling cards seems so costly. But inkjet printers have made all these possible. You can now print your own calling cards or print informal invitations or greeting cards at the comfort of your own home. Thank you Cards are easiest to print. You don't need any fancy images to signify an occasion such as Christmas trees, balloons, etc. You can print your own thank you cards without even buying any software. If you're using Windows XP, all you need is WordPad. Just Type in your message, use some fancy fonts, change the color, print it on special paper, and walah! You have your own personalized thank you cards. However, the problem with just printing your own thank you cards is that sometimes, it would seem so informal, hurried, and even cheap. You can't say the same for the thank you card shown below. This one is printed on an ecru matte finish card and the letters are embossed in gold foil. You can never duplicate this kind of card on your home and even if you're artistic and a crafts expert, I bet you that if you make 100 of this kind of greeting card, your cost wouldn't be $1.66 per card. I guess there's a right occasion for printing your own thank you cards and ordering one. Ordering personalized Thank You Cards would be a good idea if you're sending it to more than 100 people and and for events such as weddings, funerals, or any large gatherings. 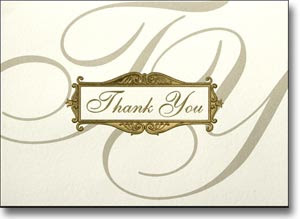 Printing your own thank you cards on the other hand is a good idea for small occasions such as a child's birthday party. Cards Direct is one of my favorite stores for ecards shopping..... also prefer Holiday Classics for it.